"Wow just experience an earthquake after shock in Haiti, thank god everyone is safe!" FLASH, FLASH, FLASH: Quake tremors are being felt right now in Haiti this morning as we speak!!! "This morning's #tremor is registered as a 5.4 magnitude earthquake. #Haiti"
These reports started coming in less than 20 minutes ago. sofar there are no reports of damages. What have you heard? How do you feel about it? « Calling Rates Haiti Now 5 Cents More Per Minute: How Often Will You Call? We need men like you, when can you help? a country does not died, only men died, we need to manage our beautiful, rich country, Haitians are very proud people, good people, seriously, when will you be able to help? We have a country.were at? Does magouilleurs, corrupt,sida, colera,voleur, mandiant,are part of the concer of nation. Is telling the true dirthy mouth well poor Haiti the world has dirthy mouth. Educate myself i am always willing to learn please educate me. Some Christians peoples in Miami had visions, Jesus is tired of all the vodoow, and all the bad things like orgies, killing ect ect in Haiti, those peoples saw in their visions Haiti is going to be destroy I didn't think this sign from God was going to be so soon. 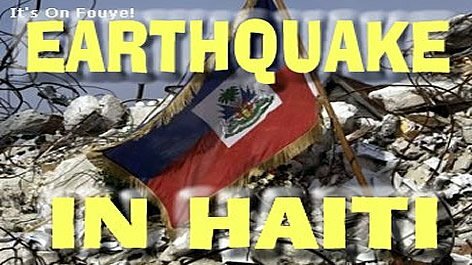 NOTHING YET MORE TO COME WE HAITIAN R NO GOOD The last quake make us more vicieu more magouilleur moree macici more corupt. I felt it this morning before I woke up. Praise the Lord there was no damage.